Re: EXDOS with HxC Floppy Emulator works perfect ! Now I tested with card formated with second entry used, the HxC say error massage. Then when my program also accept only first entry it is not a limitation, just same as the HxC. Hi, I'm a french start user (despite i have an entreprise since a few years). I've an HxC for my Oric Atmos and i found your work. What i've to find (and are the components available) to link my entreprise with an hxc like yours. But if you have experience in electronics then you can build one. 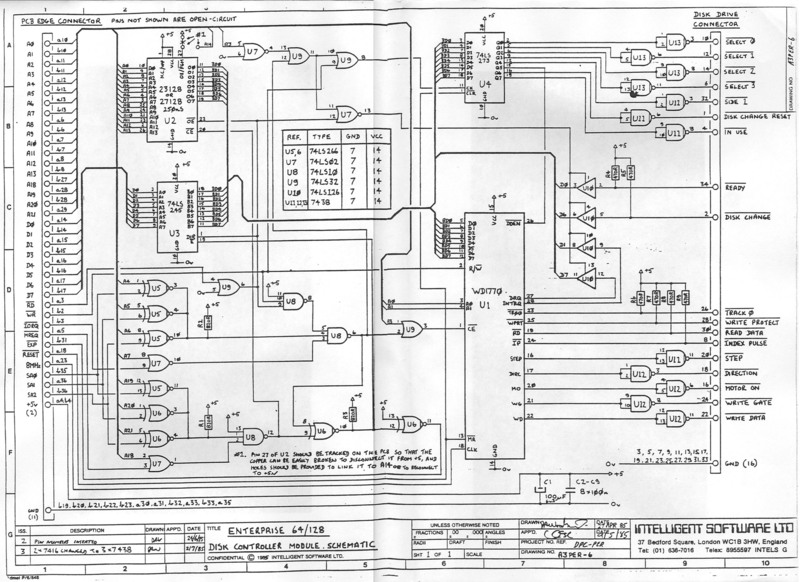 There is the schematics. Does the WD1772 work as a direct replacement for the WD1770? The WD1770 is quite hard to find cheaply. I think the only difference between the WD1770 and WD1772 is the step rate -- the WD1772 being much faster for the same settings. Yesterday at Speccyalist Day 2013 (Sinclair&Enterprise Club day) HxC used with Enterprise. On this occasion I made ROM version of the HxC Manager. I've gotten a HxC Floppy Emulator and put it on top of the EXDOS controller you built me long ago(thanks!). Even I powered it from the expansion card, and it looks much better than with the necessary PSU. I have tried all combinations, works perfect with simulation of a: and real floppy en b:(PC), but as I don't have nor need phisic disks I opted by simulate the two readers. The only problem is with your HXC prog., that put the floppy emulator in direct access mode but fills the screen with zeros and hangs. I've followed strictly your directions(or limitations) but don't know why it happens. The firmware version is V1.8.2.40. I received the emulator in January 2014. If I remember right you got a 64K EPROM to the cartridge, and MICROTEAM type EXDOS card with 128K EPROM. You remember good, you made a 64K EPROM cartridge with Basic and your EXOS modified Rom, and MICROTEAM type EXDOS card with 128K EPROM(it has four more pins than the two 32k spare sockets). Also you populated all the RAM sockets and put a WD1772 controller in it. The HxC now A: and B: drive? Under EXDOS both working?